Looking for an efficient and cost-effective way to cool multiple rooms? Multi split air conditioning is the perfect system to keep your home nice and comfortable. WHY DAIKIN MULTI SPLIT SYSTEMS? Multi split systems are more affordable to purchase and install, compared to ducted air conditioning. By controlling each indoor unit individually, you can also save on running costs. It's perfect for small homes, apartments and other buildings with limited outdoor space, as you can have multiple indoor devices with just one outdoor unit. It is easy to install as it does not require the use of long and expensive ducts, making it ideal for houses without ductwork. You can not only select the rooms you want to air condition, but you can also run and control each indoor unit independently. With the multi split system, you can choose the right indoor unit for each room, choosing quieter air conditioners for the bedrooms, or bigger ones for larger areas. 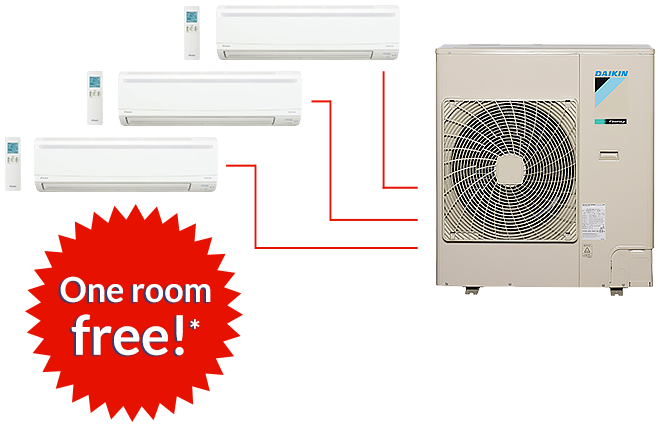 Get One (1) room FREE when you purchase Daikin Multi Split Systems! For a limited time only, enjoy high-quality multi-split systems with great savings!